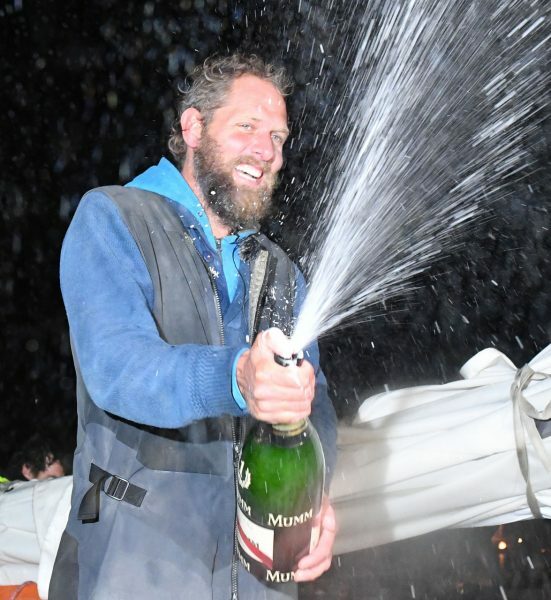 Dutch sailor Mark Slats, 41, took second place in the nonstop, round-the-world, solo Golden Globe Race last night aboard his Rustler 36 Ophen Maverick. Despite the late hour, Dutch, French and British supporters showed up in Les Sables-d’Olonne, France, to applaud his efforts to pass race winner Jean-Luc Van Den Heede as the two battled each other in the Atlantic Ocean. In this old-school race, an homage to (and an attempt to recreate) the first Golden Globe Race in 1968, Slats circled the globe in 214 days, 12 hours, 18 minutes and 43 seconds. But race organizers slapped him with a 36-hour penalty for improper sat phone use, which leaves him with an adjusted race time of 216 days, 00 hours, 18 minutes, 30 seconds. The boats carry satellite phones for emergency use only. 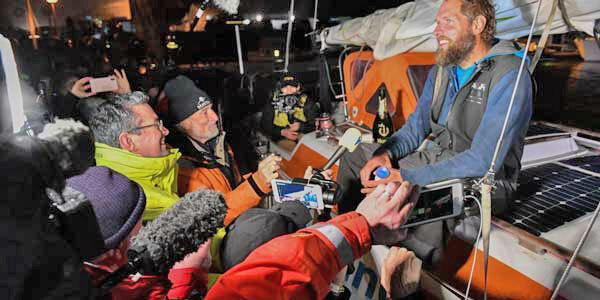 Mark Slats crossed the finish line at 23:18:30 CET last night. Early in the race, a tactical decision to follow the traditional clipper ship route on a wide sweep around the western side of the South Atlantic put Slats 900 miles behind VDH at the Cape of Good Hope. The Frenchman then extended his lead to 2,000 miles through the Southern Ocean, before his Matmut, another Rustler 36, pitchpoled some 1,900 miles west of Cape Horn. VDH then had to nurse a damaged mast for the rest of the circumnavigation. There were also issues with Van Den Heede’s Ham license, but as he put it when talking to Slats on the dock, “I had a few French friends who kept broadcasting to me.” VDH was soon 400 miles ahead again and kept this cushion to the finish. Following Mark’s finish, a dockside mediafest ensued, with photographers and journalists jostling for a word or picture. Slats celebrates after seven months alone at sea. He ran out of drinking water yesterday morning; the celebratory champagne was his first drink that day. Three skippers remain on the racecourse: Estonian Uku Randmea, American Istvan Kopar, and Finn Tapio Lehtinen. The latter is the only one still west of Cape Horn. Latitude 38’s racing desk also received a news flash this morning from Spindrift 2’s Jules Verne Trophy attempt. 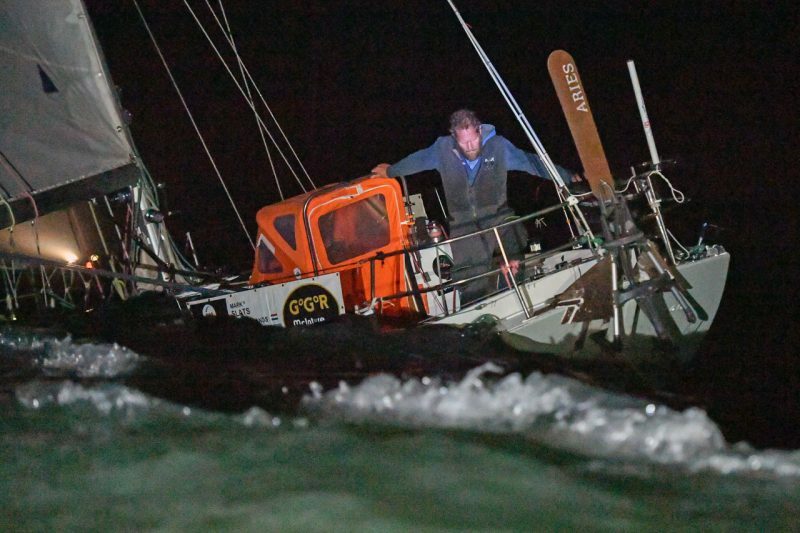 Skipper Yann Guichard contacted his shore team to report damage to the starboard rudder. It is currently nighttime in the Indian Ocean, which has hampered the crew’s assessment of their situation. The maxi-trimaran is currently sailing at 15 knots some 1,200 miles off Cape Leeuwin, Australia. See www.spindrift-racing.com. 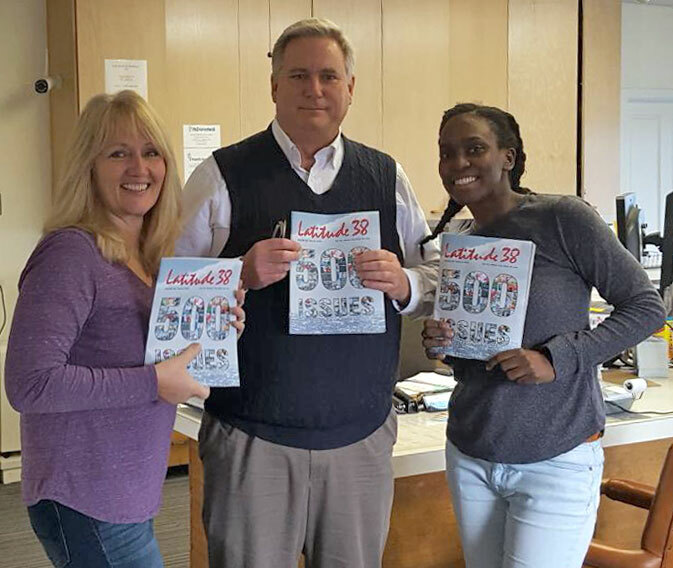 Where will you pick up your copy of the 500th issue of Latitude 38? The weekend weather looks pretty awful for sailing, but just about perfect for reading about sailing in the new issue of Latitude. Yes, you can read the entire issue online but, as they say, “Ain’t nothing like the real thing baby…” Our Bay Area drivers are out there right now hoping to complete their delivery routes before the rain starts falling, making sure you have time to pick one up at your favorite Bay Area marine store before or on the weekend. Our drivers took a few minutes to send in some pics of their first deliveries from today. 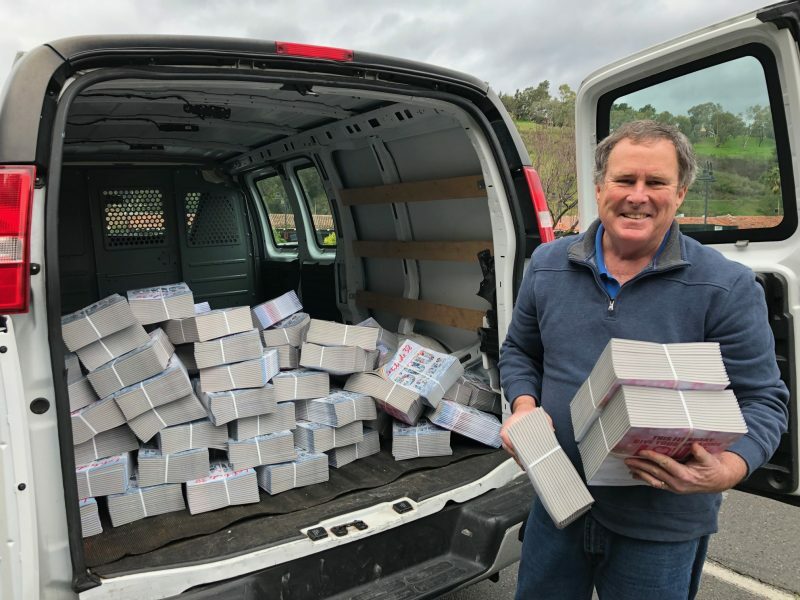 The folks at the Alameda Marina harbormaster’s office are always happy to see our driver, Sue Weaver, show up with the new issue of Latitude 38, and for their tenants to stop by and say hello when they pick up a copy. Inside the new issue we have stories about Hobie Alter and the new, very cool, bronze memorial unveiled last fall in Dana Point; a profile of Taylor Canfield and the Long Beach Yacht Club America’s Cup challenge; insights from successful cruising couples; more 2018 season winners; and a look at how the Bay Area waterfront has changed over 500 issues of Latitude 38. And that’s just the beginning. There’s a challenge from Nathalie Criou’s team, Shut Up and Drive, for this year’s Race to Alaska, the Coast Guard shutdown, and most of your Letters (thank you very much to everyone who wrote in). Who’s driving anyway? 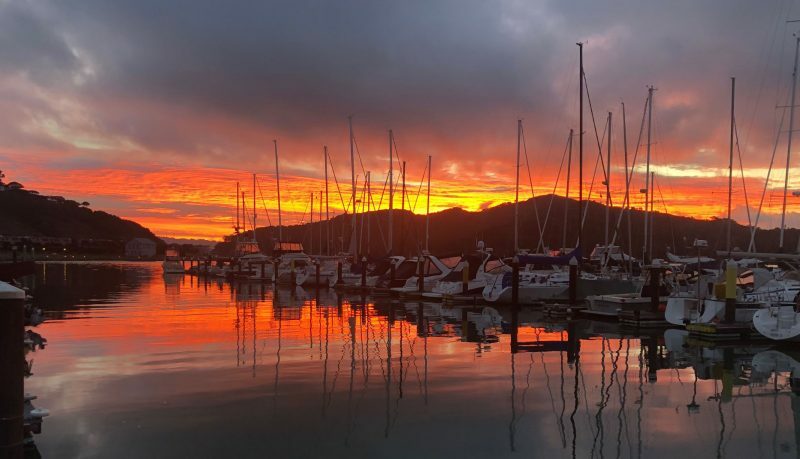 Well known as the husband of Ballena Isle Marina harbormaster, Sheila Maher, Chris Maher is spreading good will while doing his morning paper route with Latitude 38. 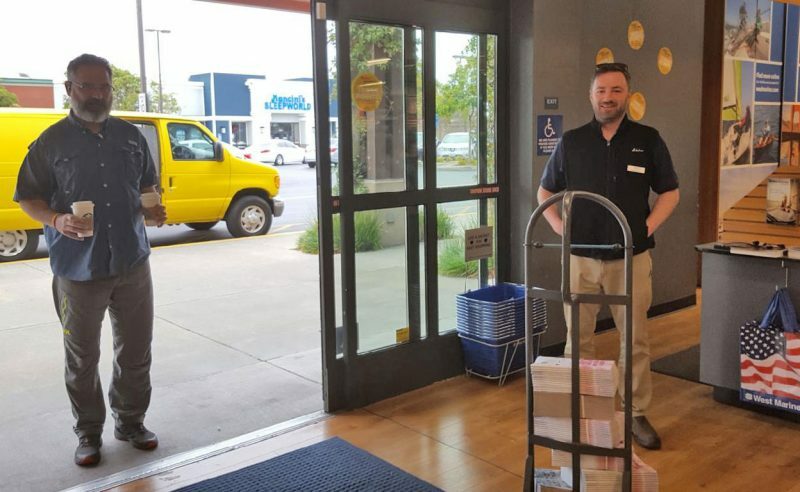 Alameda delivery driver Sue Weaver was enthusiastically greeted by West Marine store manager Neil Fraser and rigging shop manager Michael Infusino, who said people had been asking for the new issue for two days. Don’t tell the boss, but a lot of people might just shift from goofing off with their Instagram feed to hide in the back with the new issue. 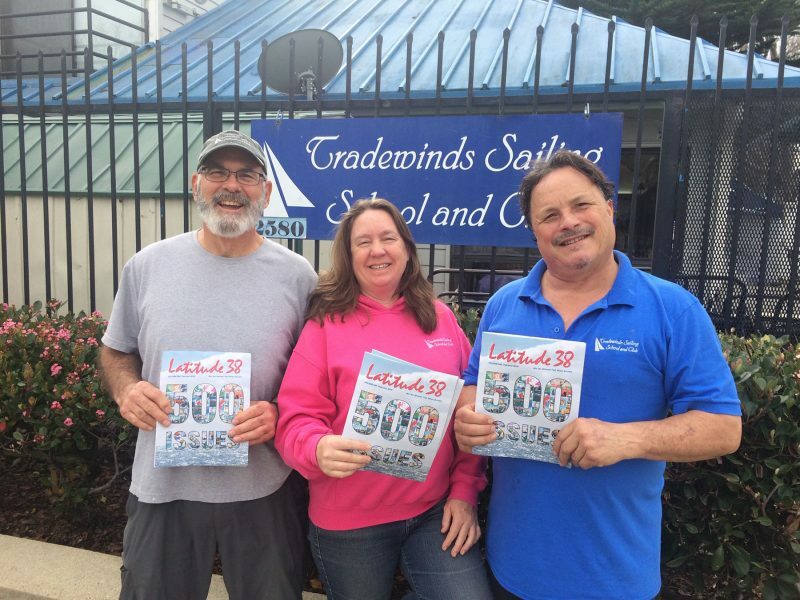 The crew at Tradewinds Sailing Center in Richmond was happy to see Chris Maher bring by Volume #500. You have to get up early to do the delivery route before the rain sets in, but it’s so often worth it. This is this morning’s sunrise looking from Corinthian YC over to Raccoon Strait and Angel Island. These people claim to be sailors, but they look like posers to us. The full story is in the Sightings section. A good number of races are scheduled for the next couple of days, though the weather doesn’t look too cooperative. It might be a better weekend to chill out with the 500th issue of the magazine. If you do go sailing, let us know — we’re already at work on the March issue. Thanks to all our magazine distributors who keep them on hand just for you. Give them a smile and say “Ahoy” when you stop by. SailGP is embarking on this, its inaugural season. The tour will come to San Francisco on the weekend of May 4-5. Tickets will go on sale on Thursday, February 21, at SailGP.com. 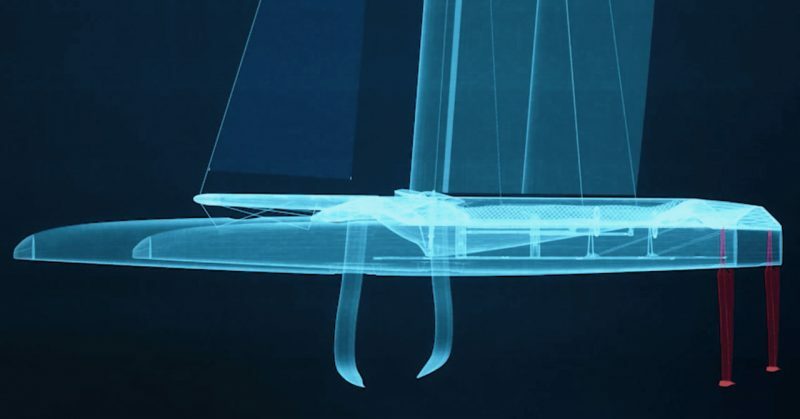 The new F50 is a redesigned incarnation of the foiling cats used for the past two America’s Cups. The F50s are expected to break the 50-knot (60 mph/100 kph) barrier. 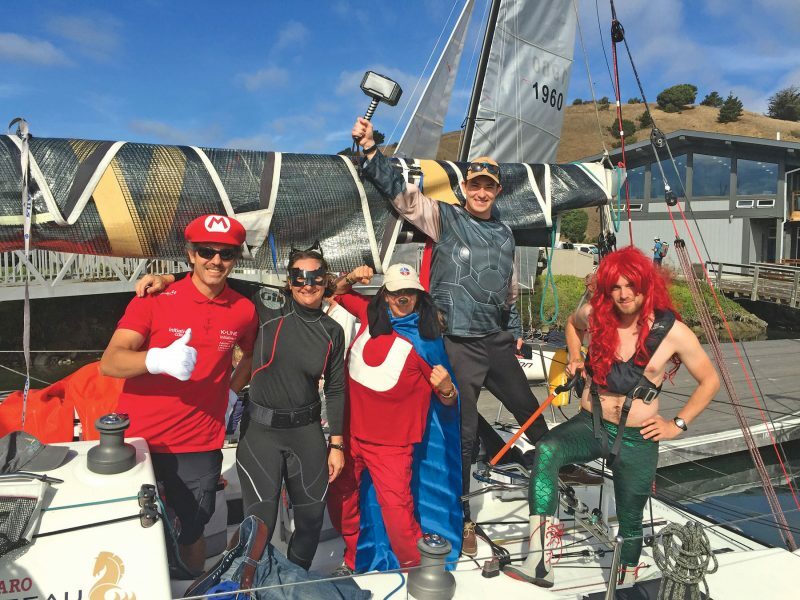 Racing on San Francisco Bay is scheduled for noon to 2 p.m., just off the Marina, with the Golden Gate Bridge serving as the sort of stunning backdrop we Bay sailors take for granted. 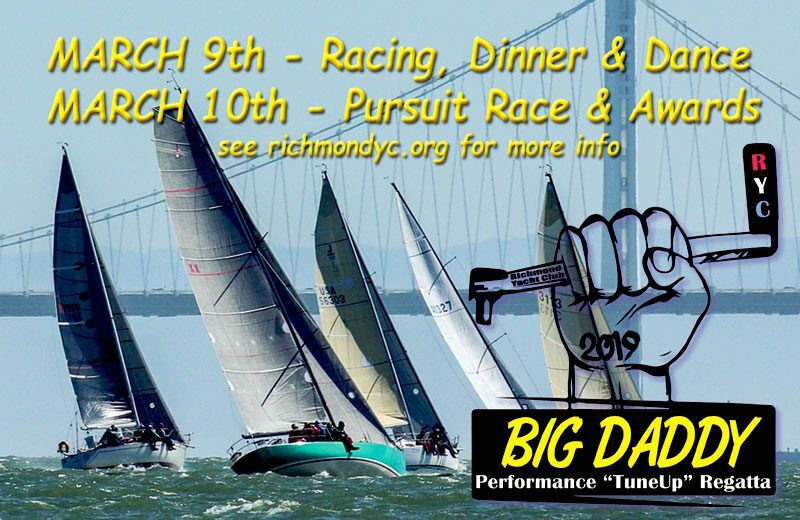 The teams will compete in five short-format fleet races, culminating with the top two teams facing off in a match-race finale to determine the event winner on Sunday afternoon. A diagram of the racing area. Fans can register at SailGP.com to receive exclusive updates on unique experiences available for the event, including access to ticket pre-sales and on-water boater registration, which offers special perks for fans wishing to watch the action from personal boats. Register early to receive race management information including detailed schedules, spectator zones and the latest racecourse maps. The five US team members are: Rome Kirby, 29, of Newport, RI (helmsman); Riley Gibbs, 22, of Long Beach (wing trimmer); Hans Henken, 26, of Coronado (flight controller); Mac Agnese, 24, of Fort Lauderdale, FL (grinder); and Dan Morris, 31, of Newport, RI (grinder). SailGP’s 2019 season will kick off in Sydney, Australia, on February 15-16. New York will host on June 21-22; Cowes, UK, on August 10-11; and Marseille, France, on September 20-22. The September finale will feature a winner-takes-all $1 million championship match race between the season’s top two teams to conclude three days of racing. All six SailGP teams will be in San Francisco practicing for two weeks prior to the start of the San Francisco event. The problem is not severe. It can barely be called a problem at all. But if you’re sitting down and helming on a long, slow run on my boat, you’ll find that you have to hunch over — almost imperceptibly — to< steer. You might even notice a little cramping creeping into your shoulders and back. The tiller seems as if it’s just a little too low. I thought part of the issue might have been my size (I’m a fairly short guy), but my taller friends have the same issue — maybe even more acutely felt — of having to ‘reach’ downward to steer. “So why not just, make a new tiller?” asked my friend, who is a carpenter, and was fully aware (I think) that he was volunteering for the job. 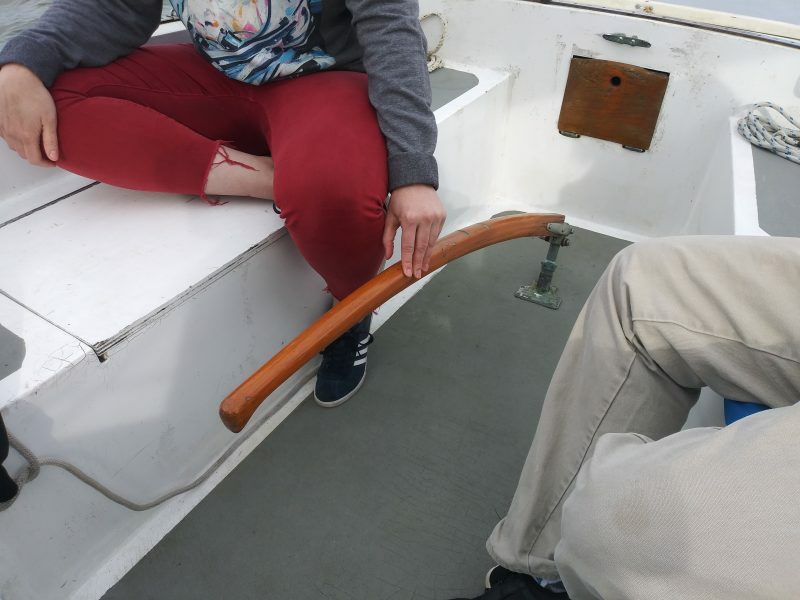 The ‘sunken-ness’ of the stick can be partially remedied by tightening up the hardware that attaches it to the rudder post. For over a year, I’ve been meaning to replace the bolts and nuts at the connection. At present, even after tightening everything with a wrench — which does put some stiffness in the tiller and helps it settle higher in the cockpit — there is an inevitable sag, and the stick eventually ends up slumping again. But in addition to this easy and more gettable fix, I also feel like the tiller is just a hair too short, and could stand to have a little more rake in it so that it naturally curves to a higher resting position. It all sounds like a brilliant idea to me. What could possibly go wrong? An outline of the stick was made to build a replacement. Like most boat projects, nothing is as easy as it might seem (especially to my inexperienced eye). This tiller — like most, I think — is several laminated layers that, as a bonus to this project, are starting to weaken at the stress points. Should we find a solid piece of wood for its replacement, or stick with a laminated stick? But seriously, Latitude Nation, what could go wrong? 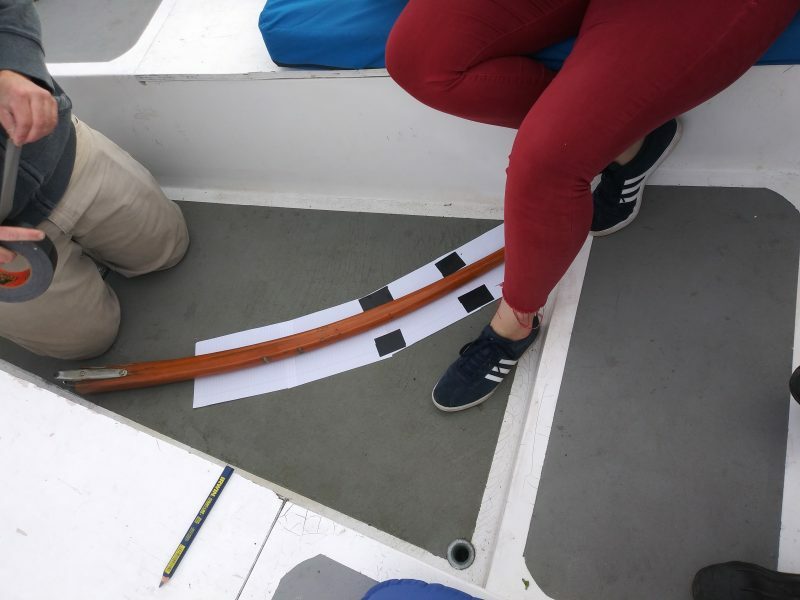 What are the disadvantages of modifying the tiller and making it larger than the original design (assuming this is, in fact, an original Columbia 24 tiller length)? I feel like tweaking the tiller is like messing with nature — not unlike those scientists who recreated dinosaurs by extracting DNA from amber. What freakish Frankenstein might come forth? What are the unforeseen consequences? Please either comment below or email us here, and please be sure to include your Boat Name, Make and Port of Call.